Over all I really liked how incredibly fast this device responded upon adjustments of the foot and how fast it accelerated to top speed. This is a safe bet any day and makes it possible for anyone to ride one of these scooters due to it being so easy to master. Satisfied Customers, 180+ reviews & a 4.5 star rating on amazon. We can’t all be wrong. Charging time, It took us 1.5 hours to fully recharge the battery. Acceleration, Far superior many of the other scooters when it comes to gaining speed. Weight Limit, 220 pounds is a bit on the low side in our opinion but we’ve read that a bit heavier shouldn’t be a problem. So I literally just got off this scooter and I’m starting to realize that all those amazon reviews aren’t wrong. Even though it has the same basic look as many other brands this scooter has something special to it. It was really hard figuring out what that special thing was but after an hour of riding I figured it out. The acceleration. Many of the similar hoverboards we’ve tested has a much slower response time and acceleration. This device answers to every small adjustment you make and it accelerate very fast. We reached a top speed of 8 mph while riding it on a leveled concrete floor which is more than advertised. This is something I really love myself, when you get more than you thought you would. Not only does the Coolreall self-balancing scooter go faster it also has that great acceleration that I just told you about. Since the CoolReall self-balancing scooter is fulfilled by amazon you’ll get a fast and reliable delivery of your product and there will be no worries about time frame and slow Chinese shipping. Also you won’t have to worry about import charges and taxes. The design is kind of the basic that most Gen 1 self-balancing scooter have. It comes in 4 different cool color variations which is. Black, white, red and blue. It’s a basic designed hoverboard which might not be as appealing as some of the other more well-designed hoverboards available. One thing I noticed is that this scooter misses the rubber cover upon the wheelhouses which in my opinion is a very good thing to have. Since it doesn’t have any protective cover there I would suggest that you buy some self-adhesive rubber and attach it on the top of the wheelhouse. This will increase its durability and protect it from nasty scratches and marks that may be caused when the scooter rolls over when you dismount. (When you order your scooter, add this to your next shopping list) This because if you are like me you won’t be willing to wait to test your device when it arrives and you’ll end up with a few unnecessary scratches easily when you’re a newbie. The turning radius is the same as with similar products and it turns on a nickel. Responsiveness of the turning is exceptional and any minor adjustment will make it turn. This is essential for smooth and easy maneuverability. The best things with this scooter is firs and foremost the acceleration and user-friendliness. 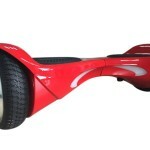 This device is so easy to mount/dismount and you will learn to ride it within 15 minutes. Not many other self-balancing scooters are this easy to maneuver. Also it’s fast and secure delivery, we got ours within 2 days. 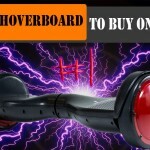 This is perfect if you’re in a hurry to get a good, reliable and safe hoverboard. Even though it might not be the fastest self-balancing scooter available it is a solid purchase any day of the week.